Nearly seven hundred kilometers south of Memphis lay the tiny village that today has become the goal of visitors from all over the world because of its remarkable ruins. Called Luxor now it was known as Thebes during its period of dominance, and as Waset before that, when it was an almost unknown village along the banks of the Nile. Thebes was an important town of Upper Egypt during the early Pharaonic dynasties, but during the Middle Kingdom (ca. 2133-1786 B.C.) it became the political and religious center of Egypt. Its later kings led invasions into Asia and Africa, and with their plunder built a city worthy of the people who ruled the civilized world. Each district in the area worshipped its own gods: Wast was the goddess of Waset, Montu was worshipped nearby, and Amun was the local deity of another village somewhat to the north. Amun was at first a variation of Min, the ithyphallic god worshipped in Koptos, but by the Twelfth Dynasty, followers of Amun gained political ascendancy and made their god the chief of all the area. He was to form the triad of Thebes, along with Mut, his consort, and Khons, their son, and he was said to head a college of thirteen gods. His influence spread, and by the Eighteenth Dynasty, his characteristics had assumed those of Ra as the sun, god, and a great single national god-Amun-Ra was formed. He was an amalgamation of numerous sun gods, by whatever names the god was called; as a composite divinity he did not have a unique theology. Most of the myths associated with him were those that earner had been identified with Ra: he was considered chief of the gods, uniter of the Two Lands of Upper and Lower Egypt, creator of all things including humankind and all other gods, captain of the solar boat, judge of the gods, defender of his eye, and victor over Apophis. 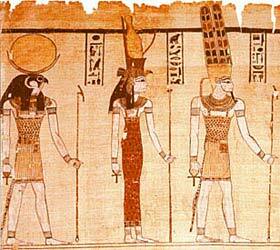 Clearly these myths were old ones assumed by the priests of Amun-Ra at the time of his ascendancy. Amun did however, have a distinct personality and visual depiction, which deserve treatment, and there are several myths reserved for this important god of all the nation.